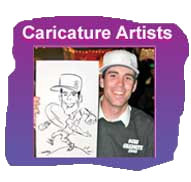 Our talented face painters use only hypoallergenic paints that come right off with soap and water. The faces shown are only a small selection of the wide range of possible choices! Let us come to your next private party or Corporate Event and your guests will never look better! The latest party or event sensation. 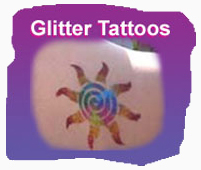 Choose from a wide selection of cool designs and our Glitter Tattoo Artist applies the hypoallergenic colorful glitter in seconds. Then, with proper care, your ultra-cool glitter tattoo can last from 7 to 10 days! Our friendly and talented airbrush tattoo artists can make your party or event something you and your guests will never forget! Browse through the chart of over 50 patterns to choose from or just have our talented artist create a custom design for you on the spot! 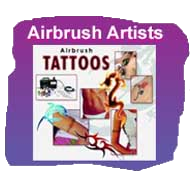 Our airbrush tattoo artists book by the hour and can tattoo up to 30 guests an hour! If you’re looking for a new twist on Airbrush tattoos, our Airbrush Body Painting is it!. Booked by the hour and package deals available. Contact us today! 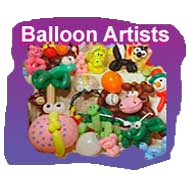 Our talented balloon artists are so amazing they are now called Balloon Sculptors! They can make anything you can imagine with balloons then they take it a step further and amaze with their art. It truly is amazing just how much can be done with a little hot air and rubber! The venerable tradition of professional clowns continues in a big way! We have some of New England’s premiere clown performers on our roster. All have been CORI checked and every one is first-rate! 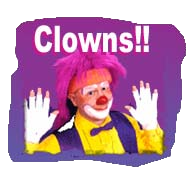 Clowns are the ideal children’s birthday performer. They do a little balloon twisting, a little magic, and it’s all done with a smile and a wink! There’s a reason clowns have been around since forever. . . they’re awesome!